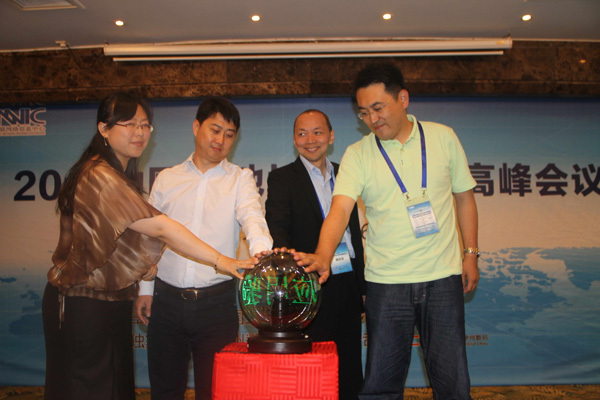 On June 6, 2012，the 2012 Summit of China IP Address Allocation Alliance was convened successfully by China Internet Network Information Center (CNNIC) in Zhuhai, Guangdong Province. Participants of the Summit, including the representatives of relevant competent authorities such as Chinese Academy of Sciences, Guangdong Internet Society, Zhejiang Internet Society and Asia Pacific Network Information Center (APNIC), as well as members of China IP Address Allocation Alliance, conducted multi-level exchanges and discussions with regards to the extensive allocation and commercial use of IPv6. IPv6 Open Exchange & Application Validation Center initiated by CNNIC was inaugurated on the summit. As is proposed on the summit, it is necessary to accelerate the promotion of IPv6 application and boost the overall transition from IPv4 to IPv6 because it poses to the Internet of China, especially the next generation Internet, a fundamental challenge that cries for solutions to the development of the next generation Internet. As is indicated by data, the number of Chinese netizens has hit as high as 538 million with an increase of 55.8 million in 2011, and the Internet Penetration Rate ascended to 38.3%. The large population of netizens aggravated the severe shortage of IPv4 addresses. Meanwhile, the booming development of new Internet applications such as smart terminal, mobile terminal, mobile internet, cloud computing, and internet of things, entail more IP addresses. The available IPv4 addresses of China fall short of the demand posed by the future development of network, resulting in a grave shortage of IP addresses. Li Tige, President of Guangdong Internet Society remarked: “the transition to IPv6 is an extremely complicated and systematic project, involving various links such as the government, operation, equipment, terminal, content, and infrastructure service. This can not be done without the concerted efforts of all circles”. In line with the development trend of IPv6 and the requirements of the next generation information technology industry, and taking advantage of the understanding to international IP Address allocation policies, CNNIC launched the “Program of Fast Access to IPv6 Address Application” in as early as March 3, 2010, namely, the members of CNNIC IP Address Allocation Alliance can apply for a portable IPv6 Address quickly and free of charge via CNNIC with a view to encouraging domestic enterprises to plan and apply for more IPv6 Addresses. More than 100 member enterprises of IP Address Allocation Alliance have succeeded in applying for IPv6 addresses via this channel by the end of last month. Subsequently, CNNIC expects to join hands with peers of the same industry to promote the trial or official commercial application of these IPv6 addresses. Liu Bing, Vice Director of CNNIC, gave an introduction to IPv6 Open Exchange & Application Validation Center (6pilot) initiated by CNNIC and remarked, “we expect 6pilot to offer the users a real and reliable IPv6 network environment that facilitates such research, test and promotion activities as technical training, network test, application development and migration, and pilot application of IPv6. CNNIC is committed to promoting cooperation among participants of the Internet industrial chain including research institutes, Internet Service Providers (ISP), Internet Contents Providers (ICP), Network equipment producers and application developers in order to build a cooperative and win-win platform and push forward the transition of IPv6. At present, 10 of the 13 roots of the entire domain name system support IPv6; under the support of CNGI project in the early period, the Chinese top-level domain name “.CN” has completed update to IPv6. A total of 19 nodes have been established across the world, and it is expected to expand to 30 nodes in 2012. Currently, the DNS analysis flow of the top-level nodes of .CN has reached 1.5 billion times per day on average, with that of IPv6 lookup accounting for approximately 10%. For the purpose of ensuring the security of the domain name system, CNNIC has deployed domain name security systems at each cooperative organization, including anti-attack equipment, security monitoring system, etc., thus significantly enhancing the security protection of domain name service nodes.